You are at:Home»Aquarium Equipment»Chlorine & Chloramine in My Water?! Chlorine & Chloramine in My Water?! Let’s take a moment to consider RO/DI Water. We all know that it is critical to use RO/DI Water in our tanks, however did you know that not all RO/DI Water is created equally? More and more municipalities and water treatment facilities are moving towards replacing the use of Chlorine with another compound called “Chloramine”. Chloramine is also known as Ammonia Encapsulated Chlorine, the molecular structure of which is seen in the photo above. The move to the use of Chloramine is largely driven by economics. Chlorine costs more than Chloramine and is less stable in water. Chlorine will dissipate from water in direct sunlight in just a few hours and will dissipate in about 12 hours in the absence of sunlight. Chloramine, on the other hand, will still be present in water after two weeks despite being exposed to direct sunlight. You can see how the use of Chloramine would be much more cost effective in water treatment plants and water delivery systems. 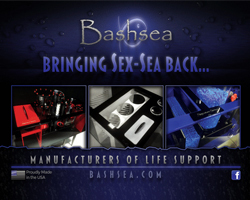 Why is Removing Chlorine & Chloramines Important? 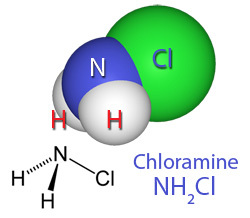 Chloramine is formed when ammonia is added to water that contains free chlorine. Depending upon the pH and the amount of ammonia, ammonia reacts to form one of three chloramine compounds. Chlorine is an oxidizer, which will burn fish gills while Chloramines pass through the fishes skin and gets absorbed into the bloodstream. The chloramine molecules then attach to the hemoglobin and form methemoglobinemia. Fish stricken by chloramine poisoning are sluggish and respire heavily. It has also been suggested that if free chlorine is present in the aquarium in can form a molecular bond with ammonia present in the aquarium, thus forming chloramine in the aquarium. This is why we want to make sure our aquarium water is free of chlorine and chloramine. So you may ask, “what does this have to do with my RO/DI water?” Simply put: Chlorine is readily removed from water by the use of regular carbon or a carbon block but as we stated above, chloramine has a more stable bond and it’s not as easy to remove as chlorine using a standard RO/DI system. As relates to an RO/DI system, chloramine can only be separated into ammonia and chlorine using Catalytic Carbon. The catalytic carbon breaks the chloramine molecular bond into ammonia and chlorine. Chlorine is then removed by catalytic carbon but at this point in the filtering process, we still need to remove the separated ammonia. To do this we will need a DI filter stage. 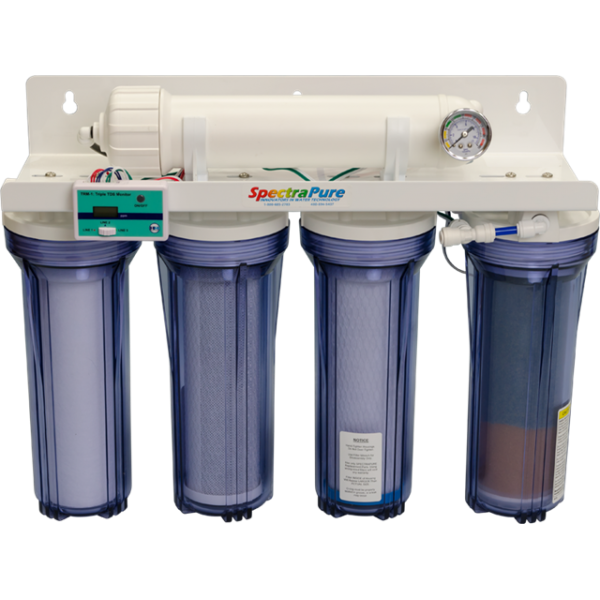 To effectively remove Chloramine, you will need a system such as the new Spectrapure Chloramine Removal 90-GPD RO/DI System as seen here. If your water company is using Chloramine and all you have is a standard RO/DI system, then you are sending “Free Ammonia” and Chlorine” through your membrane and into your aquarium environment. Also, Chloramine will cause you to have to replace your RO/DI Membrane about every 6-12 months depending upon the volume of use instead of every couple of years, on average. Federal Law requires disclosure by your water treatment plant as to whether they are using Chlorine and/or Chloramine. You may call them or check their website or annual water quality reports to find out what is in your water. We understand that Spectrapure is working on (or already has) a chloramine retro kit in the works that will be compatible with existing RO/DI systems. We expect we will be able to post a second article about this retrofit chloramine kit in the coming days. Simply put, knowledge is power. You must know the type of water that you (or your fish store) is using with their RO/DI systems in order to protect your valuable investment in the health of your aquarium and the life of your fish.